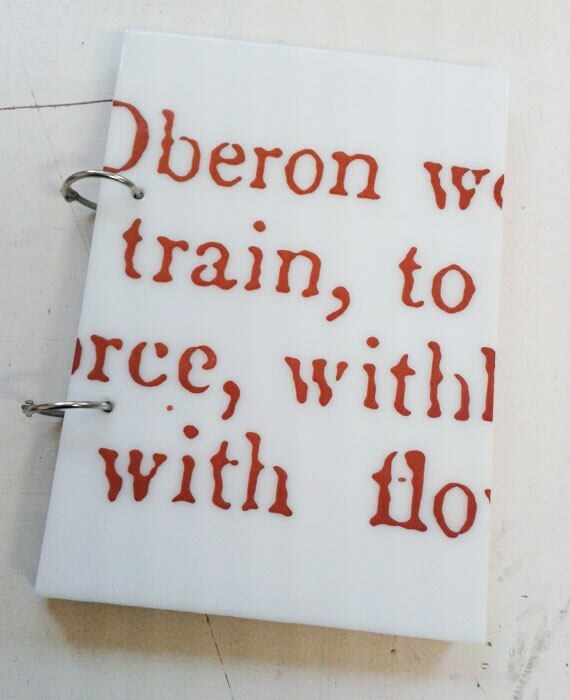 Refillable A5 glass covered sketchbook or notebook, with giant text from Shakespeare printed on white fused glass. 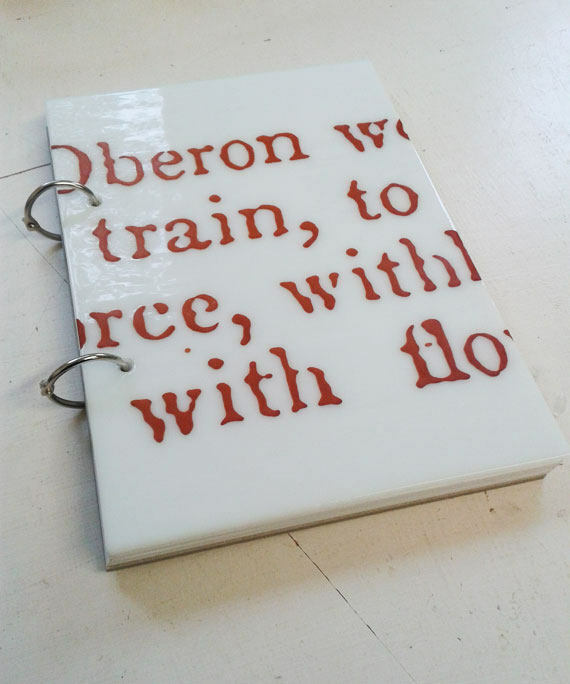 A5 sketchbook with a fused glass cover in white, giant text printed onto the cover. The text is copied from a tiny 1840s edition of Shakespeare's collected works, from A Midsummer Night's Dream. Comes with about 60 sheets of off white 160gsm paper, and a hard bookboard back cover. I take sketchbooks with me everywhere. But I got really tired of ordinary sketchbooks with floppy plastic or cardboard covers, which always get bent & manky after about a week of being carried around in my bag. So I decided I'd make something a bit more sturdy for myself. And since I work with glass... glass book covers! Which... ok, it doesn't sound very sturdy, does it? But truly these are awesome. They're are all made from 3-4mm thick fused glass, which is very strong and hard to shatter, short of dropping it on concrete from a great height. (Which, please don't.) The backing is a rock solid bookboard that's almost as hard as the glass. The paper inside is 160gsm recycled paper, off white, and perfect for sketching, drawing, or general scribbling. But the TRULY awesome thing about these is that they're completely refillable, and you don't need to spend wads of cash for more paper when you run out. Always a plus for students & artists starving in garrets, like myself. They're bound with rings which you can open & close by hand, and when you're out of space, you just refill them with whatever paper you have hanging round the place. 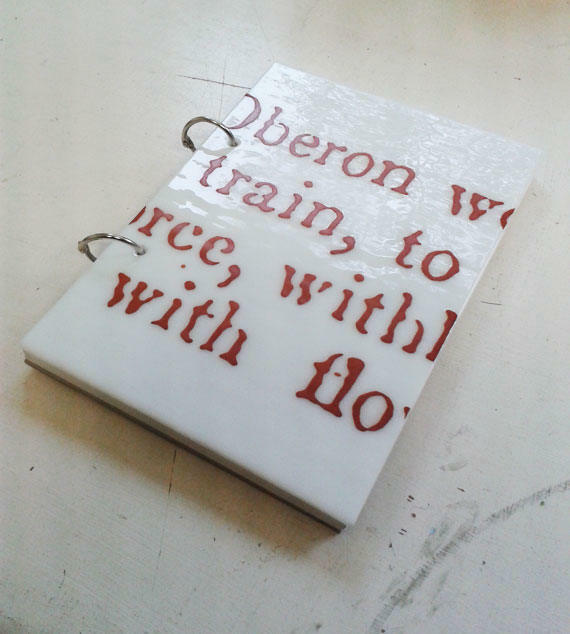 I use offcuts off big sheets of paper, old notepads, or the leftover ends of old sketchbooks. An everyday hole punch matches my books exactly, so you just cut up whatever you like, hole punch the paper with that hole punch you totally didn't steal from work, and fill your sketchbook up again. Of course, you can buy very smart, posh paper refills from me if you like, in packs of 50 or 100 sheets, and they're not at all expensive. 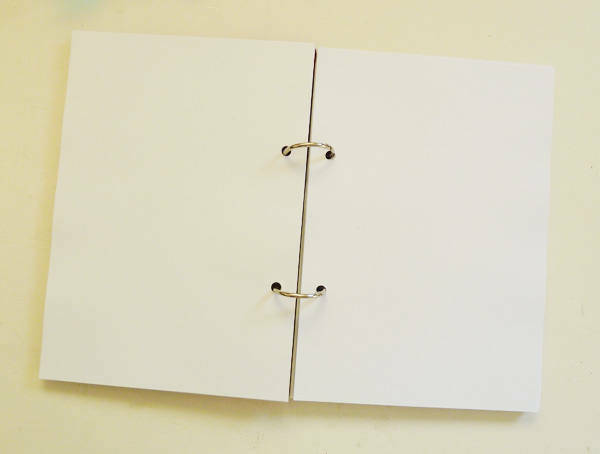 Your sketchbook comes with about 60 sheets to start with anyway. These books only come in A5 right now, though if folks are interested in different sizes I might try some out. Let me know! I can make these to order with your own artwork on the cover also, so just drop me a message if you'd like any info on that.